Makeup Revolution undoubtedly took the beauty world by storm in 2014. We beauty addicts didn’t know what hit us! Makeup Revolution has released the best budget palettes I’ve come across and their offerings keep getting better and better. They seem to launch new products almost every week making our jaws drop to the floor with each one! I wanted to share some of the products that I think represent the best of Makeup Revolution. For me, MUR does palettes like no other. I have quite a few palettes from them. Their eyeshadow palettes are out of this world for the money. I’ve previously reviewed the Makeup Revolution Flawless palette (review and swatches here) and I love the palette! Running with eyeshadow palettes, meet I heart Makeup Naked Chocolate Palette, £7.99. This is also supposedly a dupe for one of the Too Faced palettes, how could I not try it?! It didn’t disappoint! The pigmentation is amazing as usual, they’re soft, blendable and with right primer lasts well too! I’ve swatched them all below, you can see how good the pigmentation is. I’ve found the matte shadows to be well pigmented in this one too! You know I have a lot of love for blushers. I have more blushers than I will ever finish in my lifetime, so of course I needed a blush palette with 8 more pans! I just couldn’t say no to Makeup Revolution Ultra Blush and Contour Palette in Sugar and Spice, £6! I saw this in one of Khila’s (MissBudgetBeauty) videos, I think. The blushes are mostly pink-ish shades, but has two tawny shades, one coral shade and two highlighter shades. This is what drew me to the palette. This palette is all you’ll need on the cheek department. Although I’m not a fan of thehighlighter shades (too glittery for my liking), I love love the six blushes. They’re incredibly pigmented, so you need the tiniest amount on your brush for both cheeks. They’re matte, works well on top of my foundations and doesn’t slide off my face! All for 6 measly pounds! I can’t even fathom the value for money! There are variations of shades of the blush palettes, so check out the other shades, if pink isn’t your thing. Another palette I wanted to share was the Makeup Revolution Highlighting Powder Palette, £8. I love highlighters, I’ve been obsessed with the Sleek MakeUp Precious Metals Highlighting Palette (full review and swatches)! So when I saw this, I really wanted to try it out. The palette has 3 pretty large pans of highlighting powder, one is slightly pink, one is slightly warmer and another is more champagne shade! I like the formulation as they’re quite fine, and glides on nicely. They’re very pigmented so I’d use them sparingly. You need the tiniest amount to create a healthy glow. What I love these for are the inner corner of your eyes, and the brow bone. Also on top of a smoky eye, if you dab a little of these highlighters on the middle of your lid – stunning! Last palette I wanted to mention is the Makeup Revolution Sculpt & Contour Kit in Ultra Fair C01, £4.50. I think this is a dupe for the Sleek MakeUp Face Form palettes. I love the bronzer as it creates the most subtle contour and works as a lovely all over bronzer. The blusher is stunning as it's coral and has quite a bit of shimmer. I love using this as a highligter and the lightest amount as a blusher. The highlighter is quite glittery so I don't usie it much, but for me the bronzer and the blusher makes the palette! I have to say I wasn’t expecting anything at all from MUR lipsticks. I’ve tried £1 lipsticks before from other budget brands and they tend to be dry, patchy formula and smell awfully synthetic. Of course, MUR took me by surprised again and blew me away! I have two lipsticks from two ranges. The first one is the Makeup Revolution Amazing Lipstick in Treat, £1. It’s quite a neutral shade and in fact is a ‘my lips but better’ shade for me. 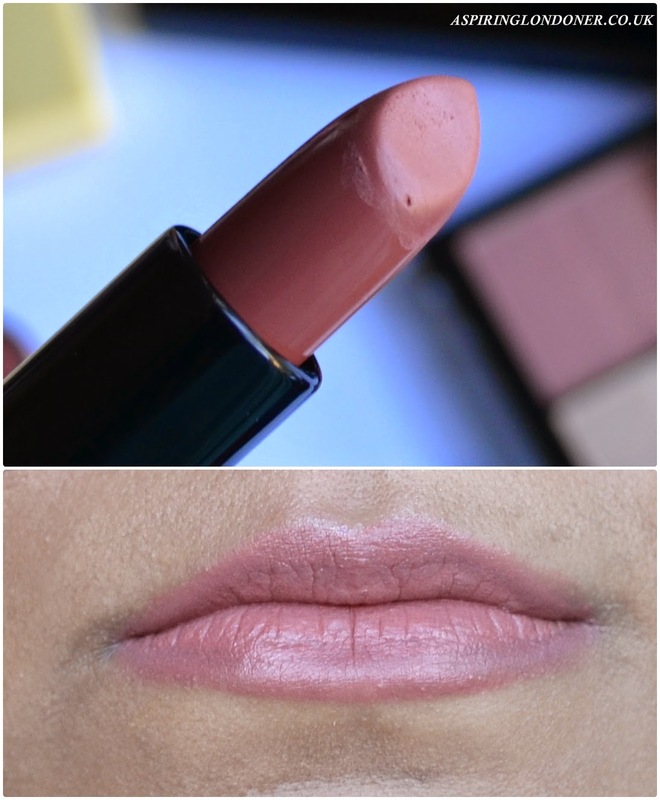 The colour is slightly sheer, the formula is smooth, creamy and really comfortable to wear. Sometimes I even forgot I had any lipstick on! It smells pleasant too. I was so pleasantly surprised by this, I’m now contemplating hoarding the whole collection! The second lipstick I tried Makeup Revolution #Liphug Lipstick in Still Missing My Baby, £2.50. These are a little more expensive and you can see and feel this in the packaging. The lipstick is much more pigmented, creamier and has intense pigmentation. This has to be one of my favourite shade of lipstick ever! It reminds me of MAC Diva a little, it’s not exactly the same, but very close. The creamy formula sits really well on my lips, feels like I have a nourishing lip balm on. The colour is amazing, opaque in one swipe, and doesn’t bleed. I definitely will be trying out more of these lipsticks too! Two other products I tried and loved are the Makeup Revolution Pressed Powder in Translucent, £2 and the Makeup Revolution Amazing Eyeliner in Ultra Black, £1.50. The MUR pressed powder is very similar to the Rimmel Clear Complexion Powder (review here). It’s very light, controls shine well and handy to travel with. I like the switch packaging and it has a little sponge applicator too, which you don’t get with Rimmel at double the price! At this price, I can afford to have a pressed powder in all of my handbags to ensure my face is never shiny! The MUR Liquid Eyeliner is great for everyday wear in my opinion. The applicator is firm yet flexible and allows you to draw the finest line! You can of course draw a thicker line if you prefer. It washes off easily and that’s a pro for me, as I hate rubbing my eye to get makeup off, at the price point – awesome! If you’re still with me, then congratulations! This has been a long post, but honestly this is a ‘curated’ version! I have so many more products I love from this brand. Makeup Revolution has really made makeup accessible to everyone with brilliant quality products at absolutely amazing value! What are your Makeup Revolution champion products? Tell me what I need to try in the comments below or tweet me @aspiring_london! Sudocrem | Miracle Worker for Acne? Benefit Cosmetics #Poreoclock Party At Newcastle!